An increasing number of foreign businesses are folding their tents in China. Multinationals used to be desperate to get into the People’s Republic. Now, as easy growth vanishes, leaving China is becoming less unusual. While some have kept a foot in the door, others have made a show of slamming it. The latest public departure is Actavis. The generic drugmaker recently declared that it had sold one operation in China and was in talks to sell another. Chief Executive Paul Bisaro told Bloomberg the country was “too risky” and “not a business-friendly environment”. For any company with global ambitions, China is hard to ignore. It is the world’s largest market for groceries, smartphones and cars, and may buy 14 percent of the world’s products by 2015, according to an American Chamber of Commerce report. Yet as Chinese consumers have become pickier, it is becoming less unusual to see companies bow out. Cosmetics maker Revlon recently withdrew, while UK retailer Tesco has retreated by folding its supermarkets into a joint venture. In the past, companies usually pulled out for China ethical reasons. Levi’s Jeans was one of the first to do so in 1993 when it pledged to avoid direct investment and pare down its use of contract workers over the country’s human rights record. Google’s 2010 exit followed a censorship row with the government. The current crop of departures has more to do with returns than high-minded principles. Revlon said China had failed to live up to its expectations, with 2012 sales only 2 percent of its global total. Tesco sold its stores after suffering years of losses, but kept a link to China through an equity stake in a joint venture with China Resources Enterprise. Even so, it’s unusual for companies to go public with their frustrations. Most are keen to maintain some kind of foothold, or at least keep open an option to come back. Levi’s eventually returned to China, and Google maintains a presence in Hong Kong. Clouds on the horizon mean Actavis is unlikely to be the last to leave. The key for others will be choosing how to go. 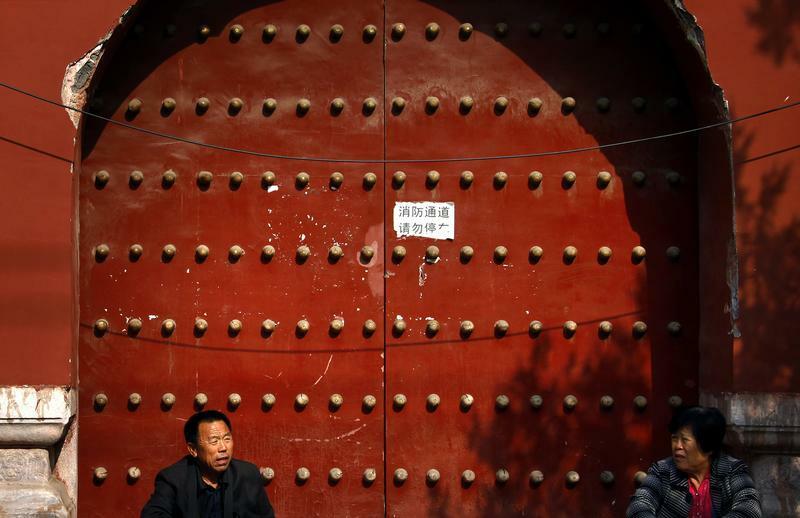 A man and a woman sit on the steps of a damaged gate marked as a fire exit at the Forbidden City in central Beijing October 25, 2012. Generic drug-maker Actavis plans to leave China, Bloomberg reported on Jan. 16. Chief Executive Paul Bisaro said in an interview that China was “too risky” for the potential return. On Dec. 31, cosmetics retailer Revlon said it would pull out of China citing low sales and cost savings.